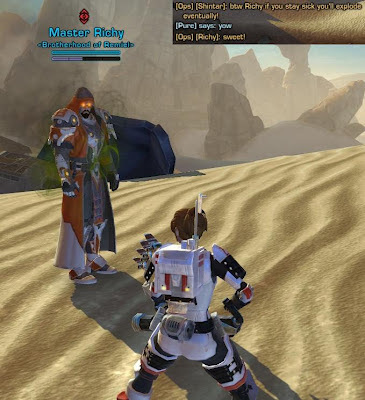 Going Commando | A SWTOR Fan Blog: World Event! Today SWTOR players all over the world were in for a big surprise. I don't know if anyone wasn't surprised, though I do seem to have a very, very vague recollection of the devs mentioning that they had plans for world events before, so it's possible that people knew about it beforehand... but I'm pretty sure that the vast majority knew nothing specific. The fact that we'd be getting a full-blown world event launched into our faces so soon after 1.2 certainly wasn't in the patch notes. For me, it started innocuous enough actually, with a guildie going on about "something" happening on Tatooine today, according to some developer's Twitter feed. His reference was really vague however and didn't exactly make any of us jump out of our seats in excitement. However, as we returned to the station after a round of dailies in the early afternoon (UK time), strange new announcements started to be made on the station. Something about an outbreak of rakghoul plague... At first I thought that maybe it was just another way for Bioware to promote the new flashpoint. However, the announcements became more urgent over time, and suddenly news terminals began to appear in front of all the major elevators on the station. 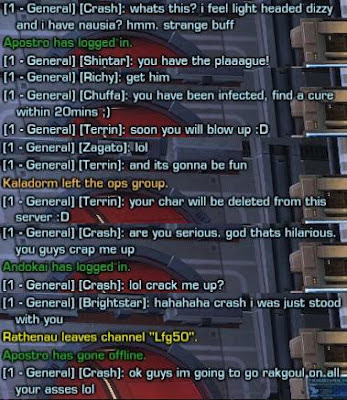 If you clicked on them you got to see a news broadcast about the rakghoul plague breaking out on Tatooine. If the government urges you to stay home to remain safe, what's the logical thing to do for an adventurer? Rush headlong into the danger zone of course! If you emerge from Anchorhead spaceport as a Republic player, you immediately find some emergency notice terminals there which treat you to another news video about the extent of the plague outbreak on Tatooine. (Afterwards you get a little buff called "informed", which I thought was a nice touch. EDIT: Apparently this is actually part of another little scavenger hunt! Check The Land of Odd for details.) It was interesting to watch how the news spread on the server, and the number of players on the planet rose steadily as the day went on. General chat was full of people asking and answering questions about what was going on, and we were eventually directed towards an area with some quests in it. As it happens we did things in the "wrong" order though, which led to some unnecessary running back and forth. Where you want to start as a Republic player is Outpost Thorazan in the Dune Sea. Travelling north-east from there, you'll find a crashed space ship just north of the road leading east towards the next sub-zone. Discovering the crash site begins a five-step daily area mission called Wreck of the Stardream, centred around discovering what happened to the ship. The area is teeming with hostile rakghouls, though I found that they seemed to have a very low aggro radius, which was quite a relief considering that it was very busy and respawns were pretty quick. More importantly though, the whole area was chock full of players from both factions, and impromptu world PvP happened all over the place, though since I play on a PvE server, not everyone was hostile. For example I cooperated with an agent to kill a gold quest mob faster for the both of us. During the quest you'll unlock two new codex entries (filed away under "Events") about the "Rakghoul Pandemic". I do recommend reading them; I thought the infected captain's last entry was particularly amusing - replacing letters with numbers truly is a sign of the insane... At the end of the little chain you're also rewarded with four Rakghoul DNA Samples and a Rakghoul Vaccine. Anyway, the light/dark side choice ends with you being sent back to Anchorhead to deliver your results to a dropbox, which results in another reward of two Rakghoul DNA Samples plus either another sample or a pair of moddable Republic Containment Officer Boots. Now, all this excitement immediately raised a lot of questions, for example: What's the point of Rakghoul DNA Samples? The tooltip says that someone on Tatooine might be interested in them, and as it turns out a special vendor has appeared with the event as well. A bit north of the ship wreck a little jawa called Jeelvic sells a couple of new goodies, basically using the DNA Samples as his currency of choice. Specifically, he offers a variety of black-green colour crystals for 75 or 83 samples each, a "Pale Rakling", which is essentially a pet rakghoul (WTF) for 60 samples and Infected Companion Lockboxes which contain a random companion customisation for 20 samples. (I don't know whether those are new or existing customisations.) He also sells more Rakghoul Vaccine for two thousand credits a pop. For how long will this event be going on then? Judging by the fact that you can only get 11 samples max from the dailies right now and that you need a lot more than that to be able to buy anything, I reckon that the event will be ongoing for at least a week or two. In my opinion it's also likely that similar plague outbreaks will occur on other planets, as the news broadcasts do hint at multiple planets being affected, and you'd expect us to get moddable Republic Containment Officer gear for slots other than our feet, which I could easily see coming from missions on other planets. Finally of course... how dangerous is the plague? You can actually catch it as a player, and I did so on both of my max level characters when it came to investigating the escape pod and all those rakghouls burst from the ground. I don't know if it's transmitted by means other than getting mauled by rakghouls though - it didn't seem terribly contagious to me, but who knows. So far it's been rather hilarious to watch people's reactions to getting infected. First off, most don't even notice immediately - including myself, but you bet that I noticed when I got dismounted from my speeder because my character needed to throw up! I became quite distressed as my sickness debuff started to sound worse and worse, no matter how much I tried to tell myself that I didn't have anything to seriously worry about in this game. I used the vaccine as soon as I got it. Other people were curious however and wanted to see what would happen if they let the plague run its course, or sometimes they never even noticed until it was too late. Apparently it does turn you into a rakghoul eventually and you do keel over dead. Again this was a source of much amusement as members of my guild blew up seemingly at random while questing on Tatooine. On the fleet I had the pleasure of recording this instance of friendly teasing of a person who didn't know what the plague was going to do to him. While I didn't see it myself, there were apparently also people jokingly advertising that they were selling the cure to the plague for large amounts of credits. I have to say, even though the rakghoul storyline in general is not one of my favourites, I'm really excited about this event. It's been a while since I got to enjoy a proper world event, and the fact that Bioware is springing one on us so early in the game's life cycle is a pleasant surprise to me. The only thing that confuses me a bit is just how bad this rakghoul plague is really supposed to be. On the one hand the story keeps going on about how it's untreatable, yet a random jawa in the desert can sell vaccines wholesale? I guess that's where storytelling and practicality collide a bit. Still, I can't argue with a wholesome amount of zombie fun. 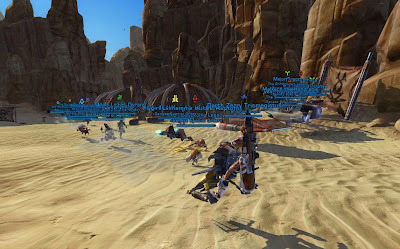 Personally, I loved the event yesterday, grouping up, people discovering the Jawa and other quests and the local chat was great. Managed to get two of the world bosses down, the bantha and sarlacc area boss, just infected trapjaw to go and he's not exactly a challenge. Good grouping content yesterday, really enjoyed myself. I wish it would go further though, the infection following through to being a ghoul yourself with the ability to infect others, much like the zombie event before wotlk in WoW. Perhaps too similar, but it didn't stop that event being epic. Perhaps there's still time for it to progress further. I really enjoyed it too. :) Will have to check out the world bosses too when I get a chance. And maybe it's because I have no particular interest in being a zombie myself, but I thought that they struck a good balance between chaos and order by allowing people to vaccinate themselves if they want to stay safe. Your description of this event makes me wonder if other MMOs could learn from this. 1) Surprising your players every now and then is a good thing. So many of the recent complaints on gaming blogs have been about games not living up to expectations and promises in some way. If your players aren't expecting anything at all and you surprise them with something nifty, they'll probably be happy even if it's not perfect. 2) Like Spinks mentioned in her post, the event isn't all about quests, and this is a good thing. Even in a theme park MMO, it's nice if a developer has enough faith in its players to not provide them with a quest description and an arrow on the map all the time. During a special event this is even easier because the content is optional and everyone will be doing it at once, so people can always ask other players for advice and not get stuck in the middle of nowhere with no idea what to do. 3) Novel idea: instead of just copying "what works" for other MMOs, copy something memorable. The nature of this event is strongly reminiscent of the WoW's WOTLK launch zombie event, and even if not everyone loved that one, it sure left an impression. I think Bioware is counting on a similar effect here, and they improved on it by making it simple to "opt out" via the vaccine if you really hate it. you get another 5 samples every time you die while infected with the 2nd stage of the plague. On my server this led to a huge pile of people standing around carrick station, and then jumping off the 2nd level of the special release cantina in the middle of the group to die and infect others. The whole thing turned into a huge rolling mass suicide for several hours. If you don't have access to the cantina you can jump down the hole in the GTN area to die and collect your samples. That sounds extremely silly! But also fun. I love love love this event. So much fun and geocaching to be had! Episode 98: Onslaught is Coming!